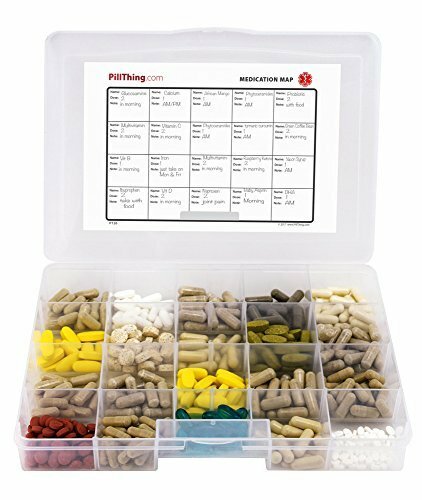 Monthly Pill Organizer with Large Compartments & Stay Tight Lid *FREE Emergency Contact Sticker and Medication Map Included! Add this Innovative New Large Pill Organizer to your Cart Today and never miss a day again! EASY TO USE Each organizer includes a Medication Map sticker so that pills are easy to identify and dispense by any caregiver. Emergency contact sticker can be applied on top for important numbers and notes. LARGE CAPACITY Large enough to hold over a months supply of medications, vitamins or supplements. DURABLE Sturdy, heavy duty plastic with rounded bottoms allow heavy use for years to com. PORTABLE Built in handle allows pills to be easily transported anywhere. It is perfect for traveling because it fits easily in a carry on bag or backpack. Perfect for caregivers, seniors, or anyone who takes vitamins or supplements regularly. Durable snug- fit lid keeps contents from spilling. Each organizer easily fits in drawer or cabinet. They are also easily stackable. (DIMENSIONS) Overall size of container approximately: 10.68" x 7.56" x 1.68" Inside dimensions of individual trays approximately: 2" x 1.75" x 1.6" Dimension of small tray in front: 2" x 1" x 1.6"
*With every purchase form the Pill Thing, we can assure that you'll be completely satisfied, if for any reason, you feel as though this product did not meet your standards, please exercise our 100% satisfaction guarantee. ⚚ EASY TO USE- Each organizer includes a Medication Map sticker so that pills are easy to identify and dispense by any caregiver. Emergency contact sticker can be applied on top for important numbers and notes. ⚚ LARGE CAPACITY- Large enough to hold over a months supply of medications, vitamins or supplements. ⚚ PORTABLE- Built in handle allows pills to be easily transported anywhere. It is perfect for traveling because it fits easily in a carry on bag or backpack. ⚚ 100% SATISFACTION GUARANTEE- If you are unhappy with this product, we will do whatever we can to ensure that you are satisfied.